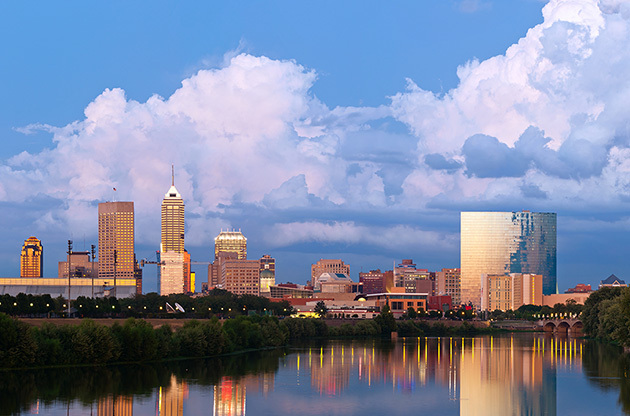 What to do and see, where to eat and shop in Indianapolis and everything you need to know about the city is here on eventegg. The racing capital of the world, one of the cities that have actually been designed by an architect, the city in which the legendary Elvis gave his last concert… Indianapolis, among the top 25 most visited cities in the US, guarantees the pleasure of discovery with its unique characteristics to its visitors. Also known by the nickname, Indy, with an approximate population of 830.000 people, is the 12th largest city in the country. Indianapolis is also the county seat of Marion County. What makes Indiana a charming destination for travelers? Well, the list probably will not come to an end if I write every single reason. However the success at being a fast growing city while being able to preserve the cultural heritage at the same time is the most important one. For sure all the games of Indiana Pacers (NBA team of Indiana), Indianapolis 500 (805 km race that is held in Indianapolis Speedway) and Brickyard 400 (602 km race that is held in the same venue) are also notable sporting events that separates Indianapolis from the other cities in the US. The soul of the city is shaped by the adrenaline in a way. And it is almost inevitable not feel the excitement that surrounds city. Indianapolis gives the visitors the chance to experience a lot of things at the same time: the joy of excitement, the curiosity that comes out of all the historical sights and monuments that fills the city, the happiness that comes out of getting to know a way of American life that uniquely stands out of the common. Now it is your turn to get some of those because Indianapolis is waiting for you. Indianapolis is located in the center of Indiana state that is in the Midwest of USA. How to get to Indianapolis? There are five airports in Indianapolis. Indianapolis International Airport is the biggest and most chosen one as it has got direct flights from many cities in the United States. It is located only 11 km southwest of the city. More information how to get to the airport or the city center from the airport can be found on Indianapolis International Airport’s website. How to get around in Indianapolis? Indianapolis has got adequate public transportation to make the best out of your trip. The local bus transportation company Indy Go provides maps and schedules. Pedicabs are also in demand in Indianapolis. Two main companies Indy Pedicabs and Circle City Pedicabs are strong competitors. Taxis are also abundant in central areas however it is better to call in advance if you have an appointment. Indianapolis has got cool museums to see, rich cultural districts and historical sites to stop by, many parks & gardens to enjoy the atmosphere and tasty wineries and breweries to have a sip of your new favorite drink. In addition, offers the visitors a full access pass to one of the world’s most famous shopping areas. Fountain Square District, Indiana Avenue, Fountain Square District and Benjamin Harrison Presidential Site are among Indianapolis’ must see places. In addition, the Children Museum of Indianapolis is the biggest children museum in the world and worth a visit. Indianapolis Motor Speedway Hall of Fame includes all those shiny collection of cars and might be interesting to check out. Indianapolis has got a range of selection when it comes to restaurants. From budget to splurge places, this city has it all. Indy also has deep roots in the music industry. There are many live music clubs. You can find any genre of live music even in the weekdays. The bars and clubs are also abundant and they are open until the first lights of the morning. Indianapolis is listed in the ‘best cities for shopping in the US’ in Forbes Magazine. And let me tell you, the place in the list isn’t in vain! Broad Ripple Village, which is located in 20 minutes walk to north from downtown, is the place for vintage lovers. Castleton is the biggest shopping mall in Indy. Fountain Square is the area you should head if what you are looking for is antique or art shops. Keystone at the Crossing & West is filled with luxurious boutiques and shiny stores that we all know somehow. Mass Ave is going to be your favorite if you are into local stuff rather than electronics or brands that can be found any part in the world. White River Gardens, Garfield Park Conservatory and Sunken Garden, Oldfields-Lilly House & Gardens are quick getaways from Indianapolis center to the middle of nature. You will be astonished by the number of kinds of plants in those parks. One of the most charming cities in United States of America, Indianapolis is home to a large number of international symposiums, congresses, conferences, fairs, tradeshows and exhibitions. The city is visited by thousands of event attendees every year and is increasingly becoming a top choice for the event organizers. The characteristic beauty of the city and the world standard venues satisfy the visitors and guarantees a fully satisfying event trip.